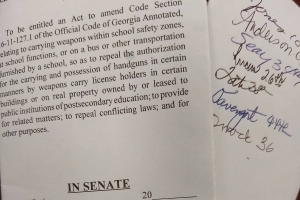 This week, I filed my legislation, SB50, repealing the “Campus Carry” law that allows licensed gun owners to bring guns onto Georgia’s public college campuses. “Campus Carry” was a very controversial bill that legislators on both sides opposed, and Governor Deal originally vetoed. Yet, despite the broad reservations against “Campus Carry,” the law went into effect in July 2017. Governor Deal’s veto recommended alternative legislation that would have increased the penalties for unauthorized possession of a firearms on campuses. In addition, he had particular concerns about vulnerable populations on campuses such as Dual Enrollment high school students and daycare centers. To appease these concerns the second time around, the legislature came up with twisted legal verbiage stating where guns can be carried and where they can’t. Sadly, Governor Deal ended up signing the amended law despite the arguments he had made against it. Campus Carry was never about making our college campuses safer. Nor was the law about preventing hunters from hunting or a woman from owning a handgun to protect herself. Campus Carry was about the gun lobby and the NRA’s strategy to reduce any kind of gun reform in light of increasing rates of mass murders using guns. The NRA loses money and power if people start to agree that military assault-style weapons are more likely to be used to commit mass murder than they are to protect a citizen from government encroachment. Gun reform has been stymied time and again by gun lobbyists because they see this issue as all or nothing. They believe guns should be allowed everywhere (including in day care centers) or else they fear, irrationally, that guns suddenly will be allowed nowhere. I encourage you to read this article about how effective Florida’s gun lobby has been over the years, and tragically, how that success allowed 17 children and staff members of Marjory Stoneman Douglas High School to be murdered in their classrooms. That image of a stressed out lobbyist losing it with a gun in the Capitol sticks in my mind as I think about how stressful college life is, and how it’s well documented that the executive function of young adult brains is not fully developed, resulting in increased risk-taking and impulsivity. We know, too, as Georgia Tech and other campuses continue to increase mental health support for students, that the availability of guns has been shown to increase suicides. Finally, during my campaign numerous parents, students, and professors told me that they feel less safe at school since Campus Carry became law. There is such a thing as middle ground. And that’s exactly what the repeal of Campus Carry is – the removal of a law that doesn’t promote freedom and only opens our campuses up to a terrible tragedy. Let’s find a rational, reasonable solution to keeping everyone safe. Campus Carry isn’t it. It’s time for a repeal. Stay tuned for updates on the bill’s progress.